The Soviet test, code-named First Lightning, had gone perfectly. At 7:00 a.m. on August 29, 1949, at a site about thirty miles south of the Irtysh River and the laboratories of recently-constructed Semipalatinsk-21 in northeast Kazakhstan, the bomb lit up the steppes. For a few seconds the observers in the command bunker, whose door faced away from the shot tower, were able to see the light of the explosion reflected off the surrounding hills. Just before the shock wave hit the bunker the door was closed. When the wave had passed, everyone rushed outside - in time to see the fireball begin to form into a mushroom cloud. Lavrenti Beria hugged Igor Kurchatov, then hurried back into the bunker. He called an observer at an observation post on the north side of the site. Satisfied that the explosion looked like the American test at Bikini (two Soviet observers had been present at the test), Beria put in a call to Stalin in Moscow, 2,000 miles to the west, where it was just after 5:00 am. Warned that Stalin was still asleep, Beria insisted that his secretary wake him up. Stalin was not pleased with the call. "What do you want?" he said. "Why are you calling?" Beria's reply: "Everything went right," did little to appease Stalin. "I already know," he said, then hung up the phone. It was one of the little ways Stalin could remind his closest associates that he trusted no one. Caught off guard by Stalin's reaction, Beria vented his anger on the nearest victim, the general on duty. "Who has told him? You are letting me down! Even here you spy on me! I'll grind you to dust!" Beria, who had his own NKVD representatives at all the nuclear plants and research facilities to keep tabs on the scientists, was hardly in a position to complain about spying. Save for the short outburst however, he was politically astute enough to let the matter drop. It was not wise to question one's boss about anonymous sources, particularly when the boss was Joseph Stalin. V. S. Emel'ianov, a scientist involved in the project, was one of the few to openly mention a well-understood fact - they would have been shot if they had failed - as he later told Heinz Barwich, a German scientist. Stalin may have received a phone call, as Beria assumed, although it would have to have been made in the short interval during which he was outside. (It could not have been made prior to 7:00 a.m., the time of the test.) Would it have come from someone in the north observation tower, housing the scientists, or from a member of the military, observing from the south tower? or would it have been someone in his own entourage in the command bunker? The phone lines to Moscow all ran through the command bunker. It seems a little odd that Stalin would have been sleeping after receiving such news. Stalin was not above playing psychological games, in fact, he seemed to delight in the smallest humiliation of real or perceived enemies. Gratitude for a job well done could quickly turn to envy or, more dangerously, a determination to eliminate a potential rival. With Stalin, as with advertising, the question was not so much 'what have you done for me?' rather it was 'what have you done for me lately,' or 'what can you do for me in the future?' If Stalin did not trust Beria, he did have reason to be grateful. Beria, as much as the scientists and physicists, had been the executive who had pushed the Soviet bomb project through to its successful conclusion. At a time when Stalin desperately wanted an atomic bomb, he recognized in Beria the ability to manage the project. With the bomb a success, perhaps Stalin's irritation stemmed from the tone of Beria's voice over the phone. To Stalin it may have sounded too much like bragging or an attempt to take credit for something Stalin was entitled to. In the paranoid atmosphere of Stalinist politics, Beria was afraid to rely on his own observations. The standard of proof, in any discussion with Stalin, was not related to the question of whether an event was factually true, rather the standard was whether Stalin believed you were lying about it. Given the time constraints Beria placed himself under, which seemingly required an immediate report of success to Stalin, he was unwilling to wait to visit ground zero himself, or to hear the report of the ground crew, sent in to ground zero just ten minutes after the test was completed. The call to the north tower would provide the evidence. "Did it look like the American one?" he asked the Bikini observer at one point. "So I may report to Stalin that the experiment was a success?" he concluded. It was then that he placed the call. The mushroom-shaped cloud kept its shape for a while, then was caught by the wind, which pushed it south, until it looked like nothing more than the smoke from a forest fire. Personality conflicts were not something unique to Stalinist Russia, even if the stakes were higher there. The American program was plagued by similar problems, which surfaced in the years following World War II, during the race to develop the hydrogen bomb. On April 12, 1954 the U.S. Atomic Energy Commission (AEC) opened a formal hearing to decide whether J. Robert Oppenheimer's top secret Q clearance should be continued. Following the hearing, which ended on May 6th, the security board recommended that the clearance not be continued. The commissioners of the AEC agreed and voted to confirm the revocation on June 29th. Robert Oppenheimer, recruited in 1942 by General Leslie R. Groves, the director of the Manhattan Project, to run the Los Alamos bomb-design laboratory in New Mexico, had been responsible for the program which provided the United States with the atomic bomb in 1945. The threat posed by Nazi Germany and Japan had been the original motivation for the development of the atomic bomb. Their defeat did not eliminate the danger posed by potential enemies. It was simply replaced by a new threat. By 1953, the danger was seen to come from Communism and the Soviet Union, which had an atomic bomb of its own. In the view of some, what was needed to counter the growing threat from Communism was an even more powerful bomb. The hydrogen bomb (H-bomb) offered the answer. For many, any opposition to H-bomb development, was tantamount to treason, as potentially dangerous as espionage itself. Oppenheimer, undecided about the need for a new bomb, offered a public obstacle to H-bomb development. His suggestion that the sharing of atomic energy knowledge with the world might be more helpful to the promotion of peace was met with suspicion, even hostility. One person who found Oppenheimer's suggestion and his views particularly irritating was Lewis Strauss, one of the AEC commissioners. He was placed in a position to deal with Oppenheimer's views when he was offered the chairmanship of the AEC by President Eisenhower in May 1953. He told Eisenhower that he did not want Oppenheimer to be associated with the agency in any way. Strauss' stated opposition related to Oppenheimer's failure to report an attempted espionage recruitment contact by Haakon Chevalier, a leftist professor of French at Berkeley, during the war as well as his opposition to development of the hydrogen bomb, even though it had been authorized by President Truman. Strauss decided that the most effective way to prevent Oppenheimer from interfering in H-bomb development was to take away his Q clearance, which gave him access to the classified documents research. The danger was not so much that Oppenheimer would deliberately sabotage or disclose the research, although Strauss may have suspected that he would not be above spying for the Soviets, rather it was the fact that access gave Oppenheimer the authority he needed to publicly debate the policy issues. Strauss was willing to bide his time and avoid an immediate confrontation. In fact he preferred to ease people out of sensitive positions with career opportunities and job offers from industry contacts. That approach had not worked with Oppenheimer, who had already taken advantage of an outside career offer. His influence and opposition remained strong. Using Senator Joseph McCarthy's growing power was a possible option, but Strauss decided against it. By December 1953 he was ready to take action on his own. He had a list of charges against Oppenheimer prepared and presented them to him at a meeting on December 21st. Oppenheimer did not offer to resign and Strauss was unwilling to directly request it. The next day Oppenheimer requested a security hearing. In the months preceding the hearing date, Strauss had Oppenheimer's phones tapped by the FBI, in the course of which conversations with his attorney were recorded and turned over to Strauss, a clear legal violation. During the hearing Oppenheimer encountered the greatest legal difficulty in trying to explain the contradictory answers he had given regarding potential espionage contacts and his failure to report them. Strauss felt that Oppenheimer's opposition to the H-bomb was almost as crucial to the case. Edward Teller was called to the stand on April 28th. Teller's answers to questions on the stand were almost as contradictory as Oppenheimer's. On the one hand, he felt that there was no reason to deny Oppenheimer a clearance on the basis of his character or intent. He then qualified the statement by saying that, as a question of "wisdom and judgment," demonstrated by actions after 1945, it would "be wiser not to grant clearance." The FBI phone taps continued after the conclusion of the hearing. Strauss learned from them that Oppenheimer was afraid that publication of his testimony would prove damaging, but was contemplating leaking favorable excerpts to the press. Strauss decided to beat him to the punch by making the entire transcript public on June 15th. The publication may have bolstered the public case against Oppenheimer, but it also proved problematic for Teller. His fellow scientists knew exactly what his testimony had been. Robert Christy, one of Teller's former students, refused to shake his hand when Teller visited Los Alamos in June. He was ready to issue a statement later to explain his testimony, then, at the urging of Strauss and attorney Roger Robb, who had cross-examined Oppenheimer for the AEC hearing, decided not to. Strauss did not want Teller to cast doubt on his own testimony, which might serve to weaken the public case against Oppenheimer. The scientists who now shunned Teller had based their opinion mostly on the testimony made public. What had not been revealed was the content of Teller's interviews with the FBI, which had occurred two years before, in May 1952. Oppenheimer, he said, had been opposed to the development of the H-bomb since 1945. In his opinion the bomb could have been developed by 1951 if Oppenheimer had not opposed it. In addition, he had persuaded Hans Bethe not to join the H-bomb project. Teller stated what he would later tell the AEC hearing, that he was not accusing Oppenheimer of being disloyal. However, Teller gratuitously threw in qualifiers which undermined that affirmation. Oppenheimer's brother Frank, was a former member of the Communist Party, he would mention. Perhaps more revealing [about Teller] was a statement during the interview unrelated to the security issue: "He [Oppenheimer] has also had great ambitions in science and realizes that he is not as great a physicist as he would like to be." Quick to lay the entire blame for the delay in H-bomb development at Oppenheimer's feet, Teller said little about the part his actions had played in the delay. Teller's managerial meddling had not exactly speeded it along. It would take the contribution of a Polish mathematician, Stanislaw Ulam, in January 1951, to make the dream a reality. 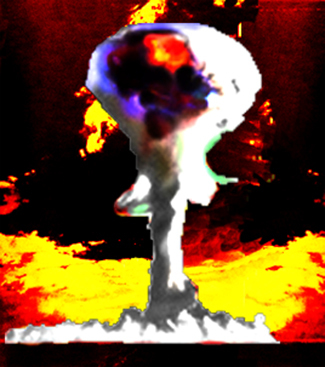 The idea of using thermonuclear compression to ignite the H-bomb was the breakthrough idea. (A "primary" bomb would be used to set off a "secondary" bomb.) On March 9, 1951, he would write a joint report with Teller. Teller, seemingly resentful, would quickly move to downplay Ulam's role, to take credit for the entire idea. By April 1951 he had re-designed the bomb by adding a second fission explosion, a "fission sparkplug" with the name "equilibrium thermonuclear gadget." However he was no longer dealing with Ulam. A reluctance to acknowledge Ulam's contribution was only symptomatic of larger problems with Teller's leadership. Even as he supported H-bomb development, he became obsessed with the importance of his own contribution. Where Oppenheimer had managed Los Alamos with a scientific curiosity which encouraged subordinates to explore new ideas, Teller tended, not only to change focus almost daily, but also to jump to premature conclusions about the feasibility of different ideas. If he didn't seek to appropriate someone else's ideas, he forced others to work on his ideas to the exclusion of their own. If he was eager to take credit for designing the H-bomb, he also wanted that credit to be for the biggest bomb ever built. In February 1950 he proposed building a one-thousand-megaton yield bomb, i.e., a "one-billion-ton [yield, not weight] Alarm Clock," as he called it. It would be capable of devastating an area the size of Pennsylvania. The technical difficulty with the design was that it would need to be detonated more than a mile above the ground to have the maximum impact and there was no aircraft capable of taking off carrying that big a payload, let alone delivering it. It could only be delivered by boat or submarine. An undeliverable bomb was only one of the problems with Teller's idea. The amount of tritium he thought was needed proved to be too small to ignite, when Stan Ulam and a colleague, Cornelius Everett, ran the calculations. Teller was not pleased when informed of the results. When a larger amount was substituted, the calculations changed little. The bomb would be a dud. Teller blamed them for providing data which "discouraged" recruiting. Their calculations also suggested that the amount of tritium needed for just one bomb, three to five kilograms, would mean a reduction in plutonium production equivalent to one hundred atomic bombs. Teller's ideas had been contradicted so many times by Ulam's calculations that when Teller embraced the new proposal, Ulam himself turned skeptical. He commented in a letter to John von Neumann at the time of his compression discovery: "Edward is full of enthusiasm about these possibilities; this is perhaps an indication they will not work." Convincing Edward Teller that his ideas would not work, however difficult, was not impossible, since he understood the physics behind the calculations. Russian scientists faced a more daunting task in persuading Lavrenti Beria. He had no understanding of the physics involved and had every reason to suspect the scientists were trying to pull a scam. Stalin and Beria had two problems. The first was that they didn't quite trust the information their spies were feeding them from the West. As General Groves commented in 1945, if the U.S. had given "the complete blueprints of the Manhattan Project to Russia on V-J Day, they would waste a couple of years searching suspiciously for a gimmick in the plans, which, they would be confident, some American had fiendishly inserted to assure Russia the privilege of blowing herself off the map." The second was that they never totally trusted their scientists. Innovation was discouraged in favor of technologies which had been proven in the West. As the physicist Abram Ioffe commented in August 1936, the attitude was one of "catch up and overtake," rather than innovation. Stalin's focus in the 1930's had been on industrialization. In the 1940's the country had been forced to shift resources to the war effort. Pure research was relegated to a secondary role as the scientific community was given projects with practical applications related to the war effort. Whether the mistrust stemmed from a lack of faith in science or simply a shortage of funds, it was often necessary to convince Stalin personally of the soundness of an idea before the government would commit resources. It would take the destruction of Hiroshima to really convince Stalin that an atomic bomb was feasible. When Harry Truman had informed him of the existence of the bomb at the Potsdam Conference on July 24, 1945, he showed little reaction, possibly because his spies had already informed him of the successful Trinity test on July 16th. It was also possible that their reports could not convey the destructive force of the explosion. Stalin was back in Moscow when news of Hiroshima arrived. He lost his temper, banging his fists on the table at his dacha and stamping his feet. He may have been tempted to order the members of his bomb team shot, but he was rational enough to realize that he was desperately in need of their expertise. When Kurchatov was summoned to his office, Stalin let him off with a stern rebuke: He had not demanded enough to accelerate the program, Stalin said. Kurchatov's defense, that it was difficult to demand anything when the country had suffered so much, seemed to deflect some of Stalin's anger, at least away from Kurchatov. More tactfully Stalin said: "If the baby doesn't cry, the mother doesn't know what he needs." He ended the conversation with a polite plea: "Ask for anything you need. There will be no refusals." Whatever feelings of sympathy Kurchatov had aroused in Stalin did not extend to the Russian people. Stalin immediately appointed Beria to oversee the project. In Stalin's eyes Kurchatov lacked the toughness to be successful as a project manager. He also recognized that, if Kurchatov was deficient in some management skills, he was one of the few people with the technical expertise to actually deliver a bomb. Beria was forced to walk a fine line. His managerial skills were most effective when it came to fulfilling requests for tangible items, such as supplying a given quantity of uranium ore. Success could be gauged by something quantifiable, e.g., the amount of ore delivered. If the quota was not met, the person responsible could be shot. The problem with the science side was that there was nothing observable, during development, with which success could be measured. The only tangible proof of success, the explosion, did not come until the end of the project. Beria was confronted with two additional problems. One was that the rules of physics were not subject to human control. Threatening the physicists would not alter the actions of molecules. The other problem was that the scientists were off limits, when it came to punishment. Beria could threaten them, but, absent clear evidence of incompetence or sabotage, they were to be left alone. Whether Stalin had a better understanding of the science than Beria, he at least could judge progress by meeting directly with the scientists himself. Stalin made it very clear to Beria that his managerial assignment was limited to the manufacturing side of operations. Peter Kapitza, one of the scientists involved in the project, wrote a letter to Stalin on October 3rd complaining about Beria's meddling. Stalin, somewhat uncharacteristically, played the role of peacemaker, urging Beria to come to some accommodation. Beria diplomatically sent a Tula shotgun as a gift. Kapitza was not appeased, even writing Stalin another letter in November. This was too much for Beria, who asked to be allowed to arrest Kapitza. Stalin's answer was: "I will remove him for you, but don't you touch him." Kapitza would resign from the Special Committee on the Atomic Bomb in December. Beria exacted a form of revenge the following year. In August 1946 Kapitza lost the directorship of the Institute for Physical Problems when he was stripped of all his scientific positions. Stalin may have been sympathetic to Beria's frustrations with the Kapitza's outbursts, however he had gone as far as he would go to appease Beria. Kapitza was placed under house arrest, but nothing more. He would die in 1984, having long outlived both Beria and Stalin. He would be awarded the Nobel Prize for Physics in 1978. If Beria could not quite grasp the physics behind the atomic bomb, Hiroshima and Nagasaki provided a rough means of translating the theoretical world into something understandable. He had security officials film the bomb's impact on Nagasaki. With photographs, the power of the bomb could be quickly grasped. Calculating the number of city blocks or square miles destroyed was not even necessary. The need for a non-mathematical measurement of an atomic bomb's blast effect may have had something to do with the elaborate reconstruction of a small city at the Semipalatinsk test site. Around the tower the Soviets had constructed one-story wooden buildings and four-story brick houses. They were pens with animals out in the open as well as covered shelters where other animals were confined. There were also bridges, tunnels, and water towers, as well as railway locomotives, tanks, and artillery pieces. Reconciling the devastation of Hiroshima and Nagasaki with the slow and almost invisible evidence of progress made by scientists toward a bomb was nearly impossible for the ever-practical Beria. The suspicion that his scientists were charlatans was not allayed by a demonstration of their first success. On December 25, 1946, the first experimental nuclear reactor built in the Soviet Union became operational. Thinking that a demonstration of the start-up process would impress Beria, they shut it down. When Beria visited a few days later they started it up again. The only evidence of any activity was the clicking of neutron counters, the flashing red lights of gamma-ray counters, and a beam of light from a galvanometer. "And that's all," he asked, "and nothing else?" Thinking that a closer inspection of the reactor would reveal more, he was warned that it was too dangerous to go down into the pile area, a warning which made him even more suspicious. 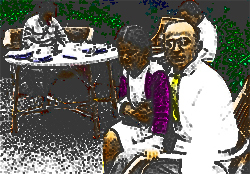 Inexperience with the newly developing reactor technology field provided Beria with more evidence of scientific intrigue. Uranium metal changes shape and swells while reactors are operating. When the A reactor at Chelyabinsk-40 began operating in June 1948 the uranium slugs swelled so badly that they became stuck and could not be removed through the discharge tubes. Beria was certain that the reactor had been sabotaged. It took some persuading by Kurchatov to convince him that, while unexpected, it was part of the learning process. Beria had another possible sabotage to investigate when the foundation pit of the B installation at Chelyabinsk-40 caught fire in 1948. The incident was serious enough to cause Beria and his staff to fly in, but apparently the explanations offered were enough to satisfy him, since he took no action. Beria was not the only one to suspect the scientists of something. In the spring of 1949 a group of generals visited Anatoly Alexandrov at Shop No. 9, to see the first plutonium bomb core. They did not discuss the physics involved or the possibility that plutonium fission might not generate an explosion. They focused instead on a more basic concern: Were the hemispheres he was working on actually made of plutonium? To prove that it was radioactive, he held a piece near a counter. They suggested that a piece of iron rubbed in plutonium could activate the counter. When he argued that the heat it was generating proved it was plutonium, one of them said that the iron could have been heated. In exasperation he said they could stay there all night and see if it was still hot in the morning. He was going to bed. They then left. Stalin's strict orders, coupled with Beria's suspicious nature, and the lack of any culprits, left him few avenues in which to vent his frustrations. The only means left was the occasional snide remark. About ten minutes before the First Lightning bomb was scheduled to detonate, Beria taunted Kurchatov: "Nothing will come of it, Igor." Kurchatov, in response, at least sounded confident: "I don't think so. We'll certainly get it." Having delivered the bomb, Beria may have wondered, after the abrupt phone conversation with Stalin, whether his services still were needed. He would survive Stalin, although not by that long. What may have preserved him, in the meantime, was the need to build up an arsenal of atomic bombs. Stalin had more to worry about than one successful test. He needed more than one bomb to meet the threat from the West. First Lightning had been postponed so that there would be enough plutonium for a second bomb. Joseph Stalin died on March 5, 1953. Beria was arrested at a meeting of the Presidium on June 26th. Nikita Khrushchev had been successful in organizing a coup. Zhukov, together with a group of army officers took Beria into custody, then ordered a tank division and motorized rifle division into Moscow to prevent MVD (Ministry of Internal Affairs) (Ministerstvo Vnutrennikh Del) units from rescuing him. His arrest would not be made public until July 10th. The Soviet government announced Beria's execution on December 24, 1953. A special judicial body of the Soviet Supreme Court had conducted a secret trial and found him guilty. Officially he was convicted of once having worked for British Intelligence. There were suggestions that he had also committed crimes involving "moral degradation." One of his guards supposedly had the names and telephone numbers of four women in his possession. There were rumors that he had had hundreds of women abducted and taken to his house, where they were raped. Publicly, at least, the government avoided mention of his involvement in the torture and murder of political opponents. The execution was not by firing squad. General Pavel Batitsky shot him in his cell. Evidence which came out before his trial suggested that, after Stalin's death, he began assuming powers related to the Soviet hydrogen-bomb project outside Party channels. In one instance he had signed his name to an authorization document reserved for the Chairman of the Council of Ministers G. Malenkov. The first design of an atomic bomb had been produced in March 1940. Two Jewish physicists, forced to flee Germany by the Nazis, Otto Frisch, an Austrian and Rudolf Peierls, working at the University of Birmingham in England, drafted a memo for their boss, Mark Oliphant, head of the physics department. They suggested that a 'superbomb,' as they called it, would only require 5 kg, or 11.023 pounds, of uranium-235 (U235), an isotope of uranium. The amount was a little more than the minimum amount needed for an explosive critical mass reaction. The critical mass of uranium, the amount which would sustain a chain reaction, according to their calculations, was relatively small - a pound or two, which would take up less space than a golf ball. A chain reaction, at the molecular level, involved the release of two or more neutrons for every neutron captured. It also gave off light and heat. Joining amounts at or above critical mass would result in an explosion. The 5 kg of U235 was much smaller than Peierls' original calculation of critical mass for natural uranium - on the order of tons. Assembling the bomb itself, without triggering an explosion, was tricky. Premature detonation would destroy any plane trying to deliver the bomb. The solution devised was to divide a sphere of critical mass uranium into two halves or, in practical terms, to manufacture two hemispheres of U235, each below critical mass and then combine them at the time of detonation. Amounts of uranium below critical mass were inert. Frisch and Peierls, in their prototype, proposed using a spring for the assembly detonator. Dividing U235 into two critical mass components solved the problem of premature detonation. The other problem involved the completeness of the chain reaction and the potency of the explosion. If only part of the uranium reacted before the force of the explosion vaporized it and blew the materials apart it might only destroy a lab or a plane. What was needed was something to keep the parts together long enough to allow the chain reaction to run its course. According to Peierls' calculations that was only four millionths of a second. Little Boy, the bomb dropped on Hiroshima on August 6, 1945, was a refinement of the prototype suggested by Frisch and Peierls in 1940. Springs had been replaced by a small cannon. It fired a U235 bullet, about the size of a can of soup, into target rings of U235 fitted to the end of the six-foot barrel. It weighed about a ton-and-a-half, 9,700 pounds, was 10 1/2 feet long, and 29 inches in diameter. Fat Man, the Nagasaki bomb dropped on August 9th, was a further refinement of the basic concept of 1940. Instead of a cannon firing a U235 bullet into a donut ring, it used a small sub-critical sphere of plutonium. Surrounding the sphere were 32 high-explosive lenses (molded explosives) which, when detonated, compressed the plutonium to critical mass. The Soviet bomb tested in 1949 also used plutonium and was similar in design to the American Fat Man. Implosion, the inwardly-directed explosion, proved to be one of the most difficult problems to solve over the course of the project. The direction of the explosion was not a problem, but making the shock waves converge evenly at the center was. Experiments with explosives packed around iron pipe could squeeze the pipe closed, but it sometimes was deformed. It would take two years, almost from the start of work at Los Alamos, in the spring of 1943, up to the Trinity test in July of 1945, to fashion a reliable implosion design. Accumulating enough bomb material for an atomic explosion proved an even bigger headache. Uranium, with an atomic number of 92 (92 protons), is the last of the naturally-occurring elements. Plutonium, atomic number 94 (94 protons), was the second artificially produced transuranic element, (after Neptunium, atomic number 93). These two elements would provide the core materials for the atomic bomb. The problem in 1943 was that neither plutonium nor the uranium isotope U235, the only materials suitable for bomb making, were available in the quantities needed. It was not even known how they could be extracted. Little Boy, the bomb dropped on Hiroshima, would use the entire supply of U235 then available - just sixty-four kilograms. Uranium had first been isolated in 1789 by a German apothecary named Martin Heinrich Klaproth from pitchblende from the Joachimsthal mines in the Ore Mountains along the German Czechoslovakian border. The first market for the grayish metallic substance was as a coloring agent for ceramic glazes. It produced a yellow at lower levels and a black at higher concentrations. The same Joachimsthal pitchblende would provide Marie and Pierre Curie with the materials used in their experiments. When scientists began studying uranium, they were able to identify two isotopes, uranium-238 (U238) (atomic number 92, atomic weight 238) and uranium-235 ( U235) (atomic number 92, atomic weight 235). The occurrence of U235 in natural uranium is extremely rare - 0.7171 percent, or seven out of a thousand atoms, compared to U238, which makes up 99.2798 percent. (A third isotope, U234, is present at 0.0031 percent.) In December 1938, Otto Hahn and Fritz Strassmann were irradiating uranium at the Kaiser Wilhelm Institute in the Berlin suburb of Dahlem. When they tried to precipitate out the uranium they found an excess amount of barium present. Barium has an atomic number of 56. Corresponding with his long-time colleague Lise Meitner in Stockholm, Hahn wanted to know whether the presence of barium meant that the uranium atoms had broken down (or split apart), or whether there was some other chemical reaction taking place. When she discussed the problem with her nephew, Otto Frisch, they concluded that the uranium indeed had split. In January 1939, Frisch conducted experiments to confirm the splitting. To name the activity, he borrowed a biological term, binary fission, used to describe the process in which one bacterium divides into two. He shortened it to fission. The fission process not only split the uranium atom in two, it released neutrons and large amounts of energy - 200 million electron volts (200 MeV) according to the calculations Meitner and her nephew made. Jeffrey Dempster, a physicist working at the University of Chicago in 1935, had first detected U235 using a mass spectrograph. What distinguished it from U238, particularly in its significance for the atomic bomb, was that it fissioned more easily. A fission reaction did not occur, even in uranium, with every atom hit by a neutron when it was bombarded. Only some of the atoms split; others captured the bombarding neutron. Whether a neutron split a uranium atom or was captured by it was partly a function of the speed with which it was traveling and partly a function of whether the isotope hit was U235 or U238. The capture of neutrons and the likelihood of such an occurrence at a particular velocity was known as the capture resonance. U238 tended to capture neutrons with a medium-range energy of 25 electron volts. At the same time, natural uranium, containing both U238 and U235, did sometimes fission with slow moving neutrons. The Danish physicist Niels Bohr thought he understood why in February 1939. Though the odds of striking a U235 atom were small, given its limited presence, the likelihood of its fissioning, if struck, were extremely good. Even a slow-moving neutron would cause a fission reaction in U235. The rareness of the fission which was occurring coincided with the low levels of U235 atoms found in natural uranium. When a fission reaction occurred in natural uranium, it was the U235 atoms which were splitting. The discovery that slow-neutron fission was possible with U235 was just one step away from an understanding of the explosive chain reaction needed to make a bomb. U235, without the hindrance of U238, and bombarded by fast-moving neutrons, would not only fission, it would fission at an explosively high rate of speed. Slow-neutron fission would not be fast (explosive) enough for a bomb, although it did have potential as an energy-producing source for power generation. The fact that U238 was unsuitable as bomb material itself did not end its usefulness in bomb production. In 1941, a chemist named Glenn T. Seaborg, began bombarding uranium compounds in the Berkeley cyclotron. By March he had separated a millionth of a gram of a new substance. In 1942 it would be given the name plutonium. Highly radioactive, Plutonium-239 (Pu239) fissioned like U235. It had another advantage. Since, with an atomic number of 94, it was a different element, it could be chemically separated from uranium. U235 and U238, in contrast, were both isotopes of uranium, making separation a more difficult process. Plutonium, in addition, could be produced using U238. If U238 was not useful as bomb material because of its tendency to capture neutrons, the neutrons it absorbed transformed it into Pu239. Seaborg's first assignment, following the identification of plutonium, was to figure out how to extract it from the uranium in a reactor, once it had been produced. What he was being asked to do was to extract a volume of plutonium about equal in volume to a U.S. dime from two tons of uranium. The problem, when he arrived in Chicago on April 19, 1942, was that a reactor capable of operating, let alone generating plutonium, had yet to be built. In addition, Seaborg had been dealing with extremely small amounts to that time. It would not be until August 20, 1942 in St. Louis, that he would finally produce a precipitate large enough to see. Construction of the first nuclear reactor would begin on November 16, 1942 under the west stands of Stagg Field at the University of Chicago. The Nobel laureate Enrico Fermi directed construction. Fermi's pile, as he called it, (officially Chicago Pile One or CP-1), was composed of graphite bricks into which holes had been drilled to hold 2 and 1/4-inch cylinders of high-purity uranium metal. Not quite spherical, the pile contained 771,000 pounds of graphite, 80,590 pounds of uranium oxide, and 12,400 pounds of uranium metal. Graphite slowed neutrons down, without capturing them. Heavy water served the same purpose, but was rare and expensive to produce. Slowing neutrons down limited the fission to U235, since both U235 and U238 would fission when struck by high-energy neutrons. There was a safety element involved as well. A fission event normally produces two or three neutrons. Only one is required for a reaction to be self-sustaining. Left uncontrolled the excess neutrons will turn the reaction into a runaway, leading to a meltdown. The ideal, from a safety perspective, is criticality, a condition where the number of neutrons remains the same from one generation to the next. Producing plutonium, Fermi's goal at Stagg Field, was aided by the slowing of the neutrons, since it allowed the U238 to capture the neutrons without fissioning. As an added safety precaution, ten control rods, cadmium sheets nailed to thirteen-foot-long wooden strips, were inserted into channels cut through the pile and distributed around it. (Cadmium absorbed large amounts of even slow-moving neutrons.) They were locked down when the reactor was not in use. One set of control rods was attached to electric motors which moved them in or out of the pile. A separate safety rod, called ZIP, was weighted to drop into the pile if its release mechanism was triggered. A second weighted safety rod was held by a rope, but Norman Hilberry, one of the Chicago physicists, was ready to cut the rope with an ax in an emergency If all else failed, three young physicists were standing above the pile with jugs of cadmium-sulfate solution. This "suicide squad" would douse the pile with the solution, hopefully stopping a runaway reaction. Another control rod would be used to control the experiment. George Weil, one of Fermi's assistants, stood on the floor to pull the rod out by hand. To monitor the reactor, boron trifluoride counters were set up to detect lower neutron levels. They gave off loud clicks when activated. Activity was also recorded on graph paper, like a seismograph. The pile was ready for testing by December 2, 1942. The temperature that day was below zero. At 9:45 a.m. the set of electrically operated rods was pulled out. The audience of twenty-five or thirty people assembled to watch stopped talking The ZIP was withdrawn at 10:00 am. The neutron clicks from the counters increased in tempo. At 10:37 a.m. Weil was ordered to pull the rod to the thirteen foot level, a marking indicating that that was the length still left in the pile. The clicking increased in intensity, then leveled off. Fermi ordered the rod pulled out another six inches. There was another increase, then another leveling off. The rod was moved out again and the levels measured. Just before 11:30 a.m. Fermi ordered the rod removed still another six inches. The same increase in clicking occurred. Then suddenly there was a loud crash. The solenoid release on the safety rod, ZIP, had been tripped by the high radiation levels and the rod had fallen noisily into the pile. Fermi's unexpected response was "I'm hungry. Let's go to lunch." Before leaving, the cadmium rods were put back into the pile and locked. The testing resumed around 2:00 that afternoon. The cadmium rods were pulled out and the manually-operated rod was set to its last position. As a precaution, the ZIP was dropped into the pile. Weil was ordered to move the manual control rod out another twelve inches. The ZIP was now winched out. Fermi said: "This is going to do it. Now it will become self-sustaining." The clicks from the neutron counters increased until they were a continuous roar. There was no leveling off, as before. The pen on the chart recorder showed a continuous line, which dropped only when the scale was adjusted to record each level of increased activity, then repeated itself. At some point Fermi raised his hand and said: "The pile has gone critical." Far from leveling off, the chart showed that the neutron intensity level was doubling every two minutes. Finally, at 3:53 p.m., to the relief of the spectators, Fermi gave the command "ZIP in!" The reactor had been running about four-and-a-half minutes. Fermi and those present celebrated by drinking a bottle of Chianti served in paper cups. General Groves was ready to exploit Fermi's experimental success almost immediately. Originally he planned to set up a semi-works for plutonium processing in the Argonne Forest, southwest of Chicago, with full-scale production facilities in Tennessee. However, the unknown hazards associated with plutonium argued against the location of a facility near a large metropolitan area, such as Chicago. The Oak Ridge facility was too close to Knoxville. A three-man team looked at sites in the West. Their final report, presented to Groves on January 1, 1943, recommended a location near Hanford, Washington. The land, about 780 square miles, (500,000 acres), was acquired by the end of January for $5.1 million. Groves estimated that the new facilities would require 25,000 gallons of water per minute. Hanford, located on the Columbia River, about twenty miles east of Yakima, promised that. With significant power needs, the location could draw on hydro-electric power generation from the Grand Coulee and Bonneville dams. In the middle of desert country, it clearly was distant from major population centers. The Du Pont company was chosen to run the site. The production piles at Hanford, unlike Fermi's CP-1, were to be water-cooled. The graphite cylinders, lying on their sides, were 28- by 36-feet, through which more than a thousand aluminum tubes had been inserted horizontally. Uranium slugs about the size of a roll of quarters, sheathed in aluminum cladding to prevent the oxidization which occurred with exposure to air or water, were to be pushed into the aluminum tubes. After being irradiated for about 100 days, new slugs would be inserted into the tubes which would force the old slugs out the back of the reactor and into a pool of water. They would remain in the pool for sixty days while short-lived radioactive by-products decayed down. There were to be three production piles constructed. Four chemical-separation plants were planned, although only three would be built, located ten miles to the south. Despite the speed with which Groves had begun the Hanford Engineer Works project in 1943, the first of the reactors, the B pile, did not start up until September 26, 1944. It soon experienced a cycle of 12-hour operational failures. A by-product with a half-life of twelve hours was poisoning the reaction by absorbing neutrons, then decaying, allowing the reaction to continue. The problem was solved by adding uranium to additional aluminum tubes. On December 28, 1944, B pile went critical for the second time. D pile had gone critical on December 17th. Plutonium production was back on track. The final step in plutonium production was to separate the plutonium from the irradiated uranium slugs. Glenn Seaborg was called in to develop a large-scale process. The irradiated slugs from the piles were first dissolved in hot nitric acid in corrosion-resistant stainless steel tanks. It was found that bismuth phosphate served as a carrier, binding with the plutonium, but leaving the uranium behind. The plutonium could then be precipitated out of solution with lanthanum fluoride. By February 1945 the yields coming out of the separation plants had reached 90 percent. Plutonium nitrate was soon being shipped to Los Alamos. U235 was the potential alternative to plutonium as bomb material. To be considered bomb-grade material, uranium had to contain eighty percent or more of U235. Enrichment is the process of increasing the percentage of a particular isotope in a mixture of isotopes. When the goal is to purify U235 for bomb making, uranium enrichment refers to the process of separating or purifying U235. Producing enriched U235 was the focus of a site half-way across the country, in Oak Ridge, Tennessee. Shortly after Leslie Groves took charge of the Manhattan Engineer District in September 1942 the government bought the 59,000 acres in eastern Tennessee, calling what would later become the Oak Ridge facility, the Clinton Engineer Works. In the early stages of the Manhattan Project, there were three proposed methods of separating U235 from U238: centrifuge separation, gaseous diffusion, or electromagnetic separation. Electromagnetic isotope separation and gaseous diffusion in 1942 were undeveloped technologies. Groves made an early commitment to both without choosing either. He would commit $100 million to a gaseous diffusion plant before problems had been ironed out with the barriers. Oak Ridge did not produce enough bomb-grade U235 to ship from Oak Ridge until early in1945. The first stage of the gaseous diffusion complex known as K-25 had not become fully operational until January of that year. Electromagnetic separation involves altering the path of an atom with a magnetic field. When an electrically charged atom travels through a magnetic field it moves in a circle, with the radius of the circle a function of the mass of the atom. Lighter atoms move in tighter circles. In the case of uranium, U235 and U238 separate into two beams as they move through the field. If a collecting pocket or barrier intersects the U235 beam, the ions will be deposited as flakes of metal. What General Groves knew at the time was only that the process had worked in the laboratory at Berkeley. The electromagnetic separation plant, called Y-12, was divided into two stages, designated alpha and beta. When it was completed there were five alpha buildings and three beta buildings. Within the alpha buildings were nine "racetracks," so-called because of the oval-shaped arrangement of ninety-six magnets along with ninety-six bins or calutron tanks for collection. (Calutron was a descriptive combination of "tron" with the University of California, where the units had been designed.) Uranium enriched in the alpha calutron units would be fed into the beta units for additional enrichment. The groundbreaking for the first alpha racetrack building took place on February 18, 1943. Its racetrack units were installed toward the end of October. However, there were problems when they began operating. The magnets were powerful enough to move the tanks, which weighed fourteen tons each. They also shorted out. It was found that the current-carrying silver bands were too closely spaced. In addition, rust and dirt particles in the oil caused shorts. Groves ordered all forty-eight units sent back to the Allis-Chalmers plant in Milwaukee for cleaning and rebuilding. The second alpha plant would not begin operations until January 1944. K-25, the gaseous-diffusion complex, encountered similar operational problems. The main problem was in designing a barrier fine enough to allow small particles to pass through but strong enough to withstand exposure to uranium hexafluoride, a corrosive gas. Nickel was ideal for its corrosion-resistant properties, but organic materials, such as grease, reacted with the gas as well, so the stream had to be kept clean. In theory, U235, being a lighter molecule than U238, would pass through the barrier more rapidly. The barrier was a thin metal membrane with millions of submicroscopic openings per square inch. It would not be until late in 1944 that a satisfactory barrier would be developed. By that time some $200 million had been spent on the construction and equipment. It was either a testimony to Groves' foresight and faith in the ultimate outcome or an indication that the U.S. government deemed the development of the bomb so crucial that it was willing to make whatever investment was necessary to ensure its success. Even with its thousands of diffusion tanks and some 5 million barrier tubes, production was so slow that Groves looked for another method to speed things up. He would eventually find it in a process known as liquid thermal diffusion. A physicist named Philip Abelson, assigned to the Naval Research Laboratory, was working at the Philadelphia Naval Yard to develop nuclear power for use in submarines. U235, being lighter than U238, would concentrate in the hotter areas of a liquid. At the center of Abelson's device was a steam-heated column around which liquid uranium hexafluoride flowed. The U235 tended to collect at the top where it could be drawn off. The system was not efficient, but it did produce large quantities of partially enriched U235. Groves and Oppenheimer decided that what Abelson's system produced could at least be incorporated into the calutrons to speed up their processing. Despite the problems with developing a suitable barrier, gaseous diffusion would serve as the main process of enrichment until the 1970s, when the centrifuge process began to be employed. The centrifuge operates on uranium hexafluoride to concentrate gas heavy in U235 near the axis. The U238 tends to concentrate near the perimeter. During 1944 Los Alamos conducted experiments to measure neutron activity as the amounts of enriched uranium approached critical mass. Bars of uranium hydride, stacked together, were used to measure the increased activity. Otto Frisch wanted to find out how much uranium a bomb would actually need. Toward the end of the year he proposed dropping a slug of uranium through a hole in a larger piece of uranium. Richard Feynman thought the experiment was like tickling a sleeping dragon's tail. Frisch built a "guillotine," a ten-foot iron tower with aluminum guides, resembling an oil derrick, to conduct the Dragon experiment. The danger was somewhat reduced by the fact that the hydride mixture was slower at reacting than pure U235. The series of experiments produced measurable increases in temperature and neutron bursts. The experiments ended on April 12, 1945. Most of the scientists were now convinced that the gun design of Little Boy would work. The mechanics of Little Boy, apart from the U235 material, could be tested like any other bomb or artillery shell. As of April, the scientists thought they had enough U235 to complete a bomb that would work. The plutonium bomb, particularly its implosion mechanism, was another matter. Oppenheimer wanted an actual test and, in late February, set July 4th as the date. He had proposed the code-name Trinity for the test and the test site sometime before October 1944. A location had yet to be determined. A physicist named Kenneth T. Bainbridge was chosen to find a location. The fact that one of the criteria was that the location needed to be within traveling distance of Los Alamos somewhat narrowed down the choices, although the Texas region now known as Padre Island was one of the eight final sites, along with another site in California. A portion of the Alamogordo Bombing Range, 210 miles south of Los Alamos and sixty miles northwest of Alamogordo was finally chosen. Ground Zero, the location for the plutonium test device was 3,400 yards northwest of the McDonald Ranch, leased by the army. The command bunker was located 10,000 yards (5.7 miles) south of Zero. At Zero a prefabricated steel tower was constructed to hold the test device. The critical mass of plutonium within a uranium tamper is about eleven pounds, making the size of the solid core for the Trinity test the size of a small orange. The accumulated shipments from Hanford had almost reached that level by May 31st. There was some uncertainty about whether there were enough implosion lens segments however, and on June 30th, the test was postponed until July 16th. Plans were proceeding for shipment of the actual bombs to the Pacific. About 2:00 a.m. on July 16th a severe thunderstorm unleashed rain and lightning over the test site. With the site meteorologist predicting a letup by dawn, Groves set the time for the test for 5:30. Kenneth Bainbridge, the physicist who had chosen the Trinity site, was in charge of the Arming Party. About 5:00 a.m. at Ground Zero he threw an arming switch which allowed the command bunker to detonate the bomb, then, together with the Arming Party, headed back. Joseph McKibben, the physicist running the countdown, started the timing sequence at -20 minutes, 5:09:45 am. Five minutes before the shot a green Very rocket went up and the siren sounded at Base Camp, five miles south of the command post. A rocket which should have given a two-minute-warning fizzled, however the Base Camp siren sounded again. At 5:29 a.m. the one-minute warning rocket went off. A gong sounded in the control bunker with ten seconds left. At 5:29:45 a.m. there was an enormous flash of light, which lasted for about two seconds, followed by an enormous ball of fire, which was seen to grow by those now watching. On August 12, 1945, three days after the Nagasaki bombing, the U. S. War Department released a report titled the "General Account of the Development of Methods of Using Atomic Energy for Military Purposes," nicknamed the Smyth Report, after its author, Princeton physicist Henry D. Smyth. Truman had given his approval to the report's release. It was a detailed summary of the Manhattan Project. It discussed uranium isotope separation, reactors, plutonium breeding, and the design the bomb. Implosion was not mentioned. Groves, in the spring of 1944, had requested that Smyth write a technical history of the project, partially to vindicate its cost and effort. With people leaving the project, the report also served as a marker for scientists about what was still officially considered secret and what could be discussed. Truman may have seen the report's release as a way of mending fences with Stalin. Wartime secrets were no longer to be kept from a former ally. On January 27, 1950, the British liaison for atomic energy matters at the British Embassy in Washington, Sir Derek Hoyar-Millar, informed Robert Murphy, the U.S. Undersecretary of State, that Klaus Fuchs had admitted to spying for the Soviet Union. Fuchs had confessed on January 24th to an MI5 officer, William Skardon. Skardon's pretext for initially interviewing Fuchs had been the offer of a teaching position made to Fuchs' father by Leipzig University, which was in East Germany. Fuchs had reported the offer to British security, however in reporting the offer he subjected his own security status to review. The information about Fuchs' espionage activities was old. It had been acquired in an illegal FBI burglary of the New York offices of the Soviet Government Purchasing Commission in 1944. Among the documents taken were copies of messages in both their enciphered and original form. In the summer of 1949 cryptanalysts deciphered a report which Fuchs had written on the progress of the Manhattan Project. While the report established that security at Los Alamos had been compromised, the evidence did not yet point to Fuchs as a Soviet agent, since it seemed just as likely that it had been passed by some other agent. Stronger proof would come in another document which mentioned a British atomic spy with a sister attending an American university. Fuchs' sister had been attending Swarthmore College at the time. Robert Lamphere, knowing that any evidence connected to the burglary was tainted, nevertheless passed the information along to British intelligence. Without a confession, the information fell short of what would be needed to charge Fuchs, let alone convict him. After several meetings, however, he finally admitted his involvement to Skardon. Fuchs was arraigned on February 3, 1950. His trial began on March 1st. He agreed to plea guilty and was sentenced to fourteen years in prison for passing secrets. He escaped the death penalty because he was not charged with treason. The Soviet Union was not an enemy nation at the time of the espionage. Fuchs had been a member of the Socialist Party in Germany but left there for Paris in 1933. He made his way to England where he secured an assistantship at Bristol. In 1940 he was interned as an enemy alien and sent to Canada. He was released from internment in December. His work in physics had caught the attention of fellow German Rudolf Peierls and in May 1941 he began working on the atomic bomb at Birmingham. Toward the end of that year he contacted a Communist Party member about spying for the Soviet Union. In 1943 fifteen British scientists were sent to help on the American bomb project and Klaus Fuchs was one of the fifteen. Their first assignment was to arbitrate the design of a gaseous-diffusion barrier. In January or February 1944 Klaus Fuchs met his first Soviet American contact, Harry Gold. In July 1944 Fuchs was sent to Los Alamos. Rudolf Peierls had been asked to work on problems with the implosion mechanism and one of the assistants he requested was Klaus Fuchs. Implosion was a major component of the plutonium bomb. Fuchs would gain more knowledge about the heart of the bomb, the initiator, a walnut-sized shell containing beryllium and polonium which would release neutrons as the plutonium was being compressed to start the chain reaction. In February 1945, when Fuchs was visiting Cambridge, he gave Harry Gold a packet of reports on bomb progress at Los Alamos. Gold would travel to New Mexico to meet Fuchs again. In Santa Fe on June 2nd Fuchs gave Gold another packet, which included a sketch of the bomb, in addition to information about high explosive lenses and a probable test date for Trinity in July. Fuchs would provide another packet of reports at a Santa Fe meeting in September. On June 14, 1946 Fuchs left Los Alamos. He reviewed the archived documents on thermonuclear weapons design before leaving. The British wanted him to help with their work on atomic bomb development and flew him out of Montreal in a bomber on June 28th. He resumed his espionage contacts with the Soviet Union in 1947, providing intelligence on the British program through 1949. Fuchs was not the only intelligence source on the bomb. Alan Nunn May, a Cambridge-educated physicist, had been part of the British atomic-energy program. In January 1943 he was sent to Montreal. Canada was building a natural-uranium reactor three hours north of Ottawa, at Chalk River. In Montreal he had access to secret reports. In addition, he traveled to Chicago and did some work at the Argonne Laboratory. Following Hiroshima his Soviet contact asked him to report on American progress. He provided details on the Trinity test, the type of bomb dropped on Japan, and even provided a foil containing U233. Another contact at Los Alamos, David Greenglass, was a machinist. He had arrived in August 1944. In the course of his duties he worked with the high explosive lenses. He was also able to provide basic information about the Los Alamos site. Due to the secrecy surrounding the Manhattan Project, the Soviets were in the dark about the locations and even the existence of the various production sites. One of his contacts was Julius Rosenberg. His wife Ethel was the sister of David Greenglass. In February 1950, a deciphered Soviet cable from 1944, led the FBI to believe that a lower-level spy had been operating at Los Alamos. They had not been able to identify David Greenglass by June. Harry Gold, by that time under arrest, would provide the information they needed, including a positive identification of David Greenglass, who was arrested on June 16th. He and his wife implicated both Julius and Ethel Rosenberg. In July Julius was arrested. Ethel was arrested in August. They were tried in March of 1951 and convicted of espionage for the Soviet Union. On April 5th both received the death penalty. David Greenglass was sentenced to fifteen years on April 6th. Julius Rosenberg would die in the electric chair at New York's Sing Sing prison on Friday, June 19, 1953. He was pronounced dead at 8:06 pm. Ethel followed a few minutes later and was pronounced dead at 8:15 pm. Leo Szilard, a Hungarian physicist forced to flee Germany because of his Jewish heritage, is generally credited with the idea of a nuclear chain reaction. As he was crossing a London street in September 1933, the thought occurred to him that there might be an element which could be split by a neutron. The split element, in turn, would emit two neutrons for every one it absorbed. If there were enough material, the collision of one neutron would produce more collisions, enough collisions to sustain a nuclear chain reaction. 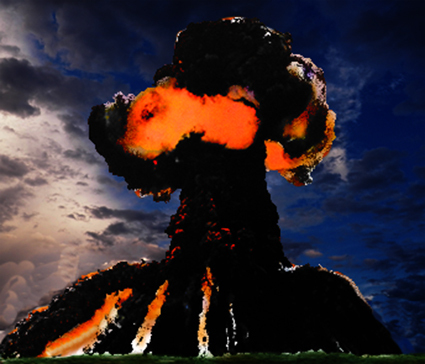 In just twelve years an understanding of the chain reaction would lead to the development of the atomic bomb. In the space of fifty years, there had been remarkable advances in the understanding of the atom and the identification of its structure. J. J. Thompson had announced the discovery of the electron in April 1897. Ernest Rutherford would discover the nucleus 1911. He would name the proton, the positively charged particle in the nucleus, in 1920. The neutron would be identified by Sir James Chadwick in 1932. Otto Hahn's and Fritz Strassman's experiment splitting the uranium atom occurred in December 1938. The scientific advances of the first half of the Twentieth Century were followed nowhere more closely than in the Soviet Union. If there was one area where Russian scientists could be expected to excel, based on their level of interest and expertise, it was that of nuclear physics. Yet their bomb development was somewhat tainted by their reliance on stolen materials. Independent verification of ideas developed outside the Soviet Union turned Soviet development of an atomic bomb into something of a two-edged sword. On the one hand, it did not say much about the state of Soviet science if it relied so heavily on stolen secrets to produce a bomb. On the other hand, the successful design of a bomb was not a simple matter of copying someone else's blueprints. Success demanded a fundamental understanding of the underlying physics. There are two additional perspectives which placed the American and Russian bomb development in a different light. In one sense bomb development was related to the exigencies of war, which demanded secrecy. There was the fear that Nazi Germany might develop the bomb first. That fear motivated many physicists, such as Leo Szilard and Robert Oppenheimer. What mattered was which side got the bomb first, not what measures it took to make sure that happened. From another perspective however, the development of the atomic bomb was purely a contest between scientists, unrelated to war or to any struggle between good and evil. The question, viewed in that light, was how to judge the achievement, particularly if one side was denied the knowledge to compete on an equal footing. What was the point of a contest, when a champion runner, with all the advantages, competed against someone who was lame? It was a meaningless victory. Henri Becquerel, a French physicist, was working with a uranium salt, uranyl potassium sulfate, in February 1896. He enclosed a photographic plate with black paper, sprinkled some of the uranium salt on the paper, and put it in a drawer. On March 1st, he developed the plate and found that the salt had produced an image, as if the plate had been exposed to light. He had discovered what Marie Curie would call radioactivity. In 1903, Henri Becquerel, Marie Curie, and her husband, Pierre, would share the Nobel Prize for the discovery. Uranium was the first radioactive element discovered. The Russian scientific community began to take an interest in radioactivity in December 1910 when Vladimir Vernadski gave a lecture to the General Assembly of the Academy of Sciences. A mineralogist, he predicted that radioactivity promised new sources of atomic energy. He urged a search for radioactive mineral deposits in Russia. In 1911, the Academy of Sciences sent out several expeditions looking for uranium. Although they visited the Urals, the Caucasus, and Central Asia, the only success they had was in the Fergana Valley in Central Asia in 1914. The deposit was not mined however. Another deposit in the Fergana Valley, at Tiuia-Muiun, produced the first uranium mine, exploited by the Fergana Society for the Extraction of Rare Metals, a private company. The ore was mostly copper, but it contained pitchblende. The uranium refined from the ore at St. Petersburg was exported to Germany. In December 1921 a radiochemist named Vitali Khlopin developed a process to extract radium from a batch of Fergana Society ore. In January 1922 Vernadski, together with Khlopin, and a geologist named Aleksandr Fersman established the Radium Institute in Petrograd. It's goal was to master atomic energy. Another institute specializing in physics had been set up by Abram Federovich Ioffe, who had done research with Wilhelm Roentgen, the Nobel laureate who discovered X-rays, in 1918. Ioffe's institute was called the Physicotechnical Institute (Institute of Physics and Technology) or more commonly, "Fiztekh." In the first ten years of its existence it focused on high-voltage electricity. The year 1932 saw the discovery of the neutron by James Chadwick as well as the splitting of the lithium nucleus. The lithium experiment was done by John Cockcroft and E. T. S. Watson at the Cavendish Laboratory. It was duplicated by physicists at the Ukrainian Physicotechnical Institute in Khar'kov the same year. Ioffe decided to organize a department of Fiztekh devoted to nuclear physics. He chose the then-twenty-nine-year-old Igor Kurchatov as director. Kurchatov built a cyclotron in 1934 with Abram I. Alikhanov. Kurchatov would begin to focus on nuclear fission in 1939. Abram Ioffe had learned of the fission experiments conducted by Otto Hahn and explained by Lise Meitner and Otto Frisch in a letter from Frederic Joliot-Curie in January 1939. Georgi Flerov and Lev Rusinov, physicists at Fiztekh would report secondary neutrons with fission experiments in April 1939. The possibility that a fission reaction could lead to a bomb occurred to Soviet scientists at the Institute of Physical Chemistry in 1939. 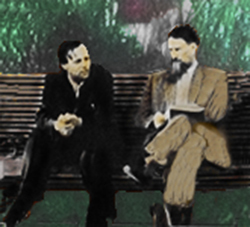 Yuli Khariton and Yakov B. Zel'dovich calculated the results of nuclear chain-reactions. In the summer of 1939 they reported their results at a Fiztekh seminar. Khariton and Zel'dovich looked at the application of their chain-reaction studies to reactor development. Scientific information about fission was still coming out of the West. Francis Perris, a French physicist, had published a paper calculating the critical mass for a uranium chain reaction. When they saw the paper they began their own research. They were also interested in verifying Bohr's conclusions about U235 and U238. They published two papers in the Soviet "Journal of Experimental and Theoretical Physics" (ZhETF) (Zhurnal eksperimental'noi i teoreticheskoi fiziki) in October 1939. Natural uranium, whether in the form of uranium oxide or metal, with its high concentration of U238, would not sustain a chain reaction, they concluded. Their second paper discussed the enrichment of U235 as an alternative to the use of deuterium (heavy hydrogen) or heavy water as a moderator. Khariton would explain their research at the fourth All-Union nuclear conference at Khar'kov in November 1939. While most Soviet scientists did not question the results, they were skeptical of any short-term applications. The possibility of uranium separation seemed a long way in the future. In 1940, two researchers, Georgi Flerov and Konstantin Petrzhak, observed a phenomenon they described as spontaneous fission occurring in uranium. Fission took place even when the uranium was not being bombarded by an external neutron source. A remote possibility in November 1939, a working bomb, looked closer to reality in mid-1940. On July 30, 1940, the Soviet government created a special Commission on the Uranium Problem. Vitali Khlopin, the radiochemist who had developed the 1921 radium extraction process, was named chairman. Vladimir Vernadski, the 1911 promoter of radioactivity studies, along with Abram Ioffe, were appointed his deputies. The change had been prompted by a New York Times article by science correspondent William Laurence, which appeared in the Sunday, May 5, 1940 edition. Vernadski's son, George, who was teaching history at Yale University, sent him a copy of the article. What aroused the interest of Soviet scientists the most was not the warning about the progress German scientists were making toward a bomb. Instead it was the reference to U235 and the suggestion that the only thing standing in the way of atomic energy use was the inability to separate U235 from uranium. Igor Kurchatov, if unable to determine government policy, could at least inspire scientists to dream about possibilities. At the Fifth All-Union Conference on Nuclear Physics held in November 1940, Kurchatov not only suggested that a nuclear reactor could be created, but also asserted that a uranium bomb could be built. He was even willing to provide an estimate of the cost. When he was through speaking, those attending the conference began to almost sneak out of the auditorium to join an electrified discussion in an adjoining room. Whatever dreams his speech had created were pushed into the background after the German invasion of June 1941. The Russian struggle to survive took precedence over scientific dreaming. Kurchatov himself switched to war-related but less glamorous efforts to demagnetize surface ships and later submarines at Sevastopol. Georgi Flerov was reluctant to give up on nuclear possibilities. In December 1941 he gave a seminar to the Academy of Sciences, temporarily at Kazan, not only arguing for bomb development, but also proposing a "cannon" design in which two subcritical hemispheres would be suddenly driven together. On November 23, 1942 General Zhukov's pincer's closed around the German Sixth Army and remnants of the Fourth Panzer Army at Stalingrad. While the German forces would hold out until February 2nd, the Fall encirclement was an indication that Russian military power was recovering from the losses of 1941. The army's recovery seems to have coincided with Stalin's own recovering self-confidence. There were signs, in the fall of 1942, that the slumbering Soviet bomb program was being awakened, if not yet put on the fast development track. Stalin at least took the step of appointing a new overall director for the bomb project, Vyacheslav Molotov. What may have convinced Stalin of the need to begin bomb development was probably not the enthusiasm or ever-optimistic predictions of Soviet scientists. Georgi Flerov, then a second lieutenant in the Soviet Air Force, had written directly to Stalin in April 1942, complaining that the scientific community was dragging its feet on uranium development. Instead it was the growing espionage evidence coming in from field agents in foreign countries. The information received was rather vague and did not yet include bomb blueprints. There were suggestions that Germany might be working on a bomb, while there was more specific evidence that the U.S. and Britain definitely were. The position of scientific director, technically subordinate to Molotov, would have responsibility for translating the complexities of physics theory into a working bomb design. Whether Igor Kurchatov was the obvious first choice, the position fell to him after others, such as Abram Ioffe, turned it down. He was officially confirmed as scientific director on March 10, 1943, following a lengthy series of interviews and discussions which took place during the fall of 1942. Kurchatov, by some accounts, was close to being eliminated, but turned things around with the impression made during his interviews. At the same time, his background clearly qualified him for nearly any activity in the field of nuclear physics. During a stint as supervisor of the physics department at the weather station in Baku in 1923 and 1924 he had measured the alpha-radioactivity of freshly fallen snow. He had been nicknamed "the Beard" by his colleagues for his distinctive beard. In December 1941, he had come down with pneumonia and chose not to shave during the illness. After his recovery he vowed not to cut it until after victory had been achieved. Around the time Kurchatov assumed the scientific directorship, he was shown the espionage material on foreign bomb program progress. The material brought him somewhat up to date on the state of Western research, although, to someone with his background, it provided few real surprises. It did promise to shorten development time by eliminating non-productive paths. Discussion of separation methods confirmed some of his thinking about the most efficient and least expensive approaches. He also found confirmation for the basic bomb design Soviet scientists had proposed, namely a bomb core which split a critical mass of uranium into two parts to be united only at the time of detonation. What he perhaps found most intriguing were references to an unnamed element with a mass number 239, with a potential as bomb material nearly as useful as U235, and which was produced as a by-product of a chain-reaction. The "unnamed" element was plutonium. The references to plutonium, which Kurchatov referred to as eka-osmium, were enough to convince him that a plutonium bomb might avoid the isotope separation problems associated with U235 enrichment, particularly when none of the separation techniques then available had been proved. At the same time, eka-osmium was an unknown quantity. If it might be easier to separate, he did not know whether it actually had the same bomb-related qualities as U235. He was also hampered by the demands of the war. Stalin, convinced of the need for a bomb, apparently felt no urgency about achieving that goal. Even as Kurchatov was taking the reigns of his fledgling organization in the spring of 1943, the Red Army was readying its defenses around Kursk for the anticipated Nazi offensive. Despite the limitations imposed by the war effort, Stalin was willing to provide Kurchatov with new surroundings and equipment. The Academy of Sciences officially directed the creation of a new lab devoted to nuclear research on April 12, 1943. For the sake of secrecy, it was called simply Laboratory No. 2. With the main focus of the military effort the defeat of the German army, Kurchatov's early role was that of planner. One of his earliest projects was the design and development of a reactor. He was unaware, in March 1943, that Fermi's Chicago graphite pile had proved itself a success in December of 1942. However he felt certain that either graphite or heavy water would make the best moderators. While he recognized that heavy water might be the better choice, he chose to work with graphite because it was within the production capabilities of the Soviet Union. The first tangible achievement was not a nuclear reactor, but a cyclotron, and it was slow in coming. Using the 75-ton magnet from the Elektrosila plant, it produced its first deuterium beam at 2:00 a.m. on September 25, 1944, some eighteen months after its March 1943 beginnings. The cyclotron, in operation, would ultimately prove successful, but progress on the research side was as agonizingly slow as the construction of the machine itself had been. 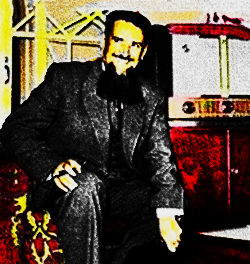 Igor Kurchatov's brother, Boris, did manage to obtain trace quantities of plutonium in October 1944, using uranium irradiated in the cyclotron. However it would be 1946 before Boris could separate plutonium in any quantity from the cyclotron-irradiated uranium. Kurchatov, as a political gesture, assigned part of the plutonium separation work to the Radium Institute. In April 1944, an expanding Laboratory No. 2 moved into facilities formerly intended for the All-Union Institute of Experimental Medicine north-west of Moscow. The number of staff had reached 74 people. The expansion did not help with the supplies needed for a reactor. Graphite seemed to be the easiest ingredient to obtain. Some 3.5 metric tons were produced by the Moscow Electrode Factory in the fall of 1943, however ash and boron impurities absorbed too many neutrons to make the production run suitable. It would take until the summer of 1945 before the purity level was sufficient for reactor use. The uranium quantities demanded by the bomb project required an overhaul of Soviet geological exploration procedures. While committees would be formed as early as 1943 to plan exploration, it was only in September 1945, after Hiroshima and Nagasaki, that serious field expedition work began. In the short run the uranium shortage was partially solved by an agreement made with the Czechoslovak government in the spring of 1945. The government would give the Soviet Union exclusive production rights to the old Joachimsthal mines. The Czechs would be paid for the costs of mining the ore, plus a profit of ten percent. The Soviets also managed to find 100 metric tons of uranium ore in the Soviet section of Germany. Even more valuable were unexploited uranium deposits in southwest Saxony, on the slopes of the Erzgebirge mountains. General Groves took steps to make sure that Kurchatov's program received as little uranium as possible. An Anglo-American body known as the Combined Development Trust (CDT), set up in June 1944, tried to corner the market on uranium by buying up uranium rights around the world, Groves also convinced the Allied Command to order a bombing raid on a metal-refining plant, the Auergesellschaft Works at Oranienburg, about fifteen miles north of Berlin, on March 15, 1945. The plant was one of the few facilities capable of making cubes and plates of uranium metal. The raid, with 612 Flying Fortresses, dropped high explosive and incendiary bombs which destroyed the site and made it useless to the Soviets. With the appointment of Beria to head the Special Committee on the Atomic Bomb, set up on August 20, 1945, the Soviet bomb project began to gather speed. If scientists had to put up with the NKVD generals, the "plenipotentiaries of the Council of People's Commissars," Beria assigned to watch each of the nuclear plants and research facilities, the fear his name inspired gave their supply requests a higher priority. In addition, the special "Department S" set up in the NKGB to deal with foreign intelligence information, helped them by organizing and evaluating the information which came in. A Moscow University physicist named Iakov Terletskii was appointed scientific advisor in September. Beria could move a project along by motivating people to action, but he had little control over the geological formations containing uranium deposits. The commission set up to look for uranium had to guess about where new reserves could be found. Some uranium deposits had been discovered at Taboshary, Uigar-Sai (Atbashi), and Maili-Sai in Central Asia, but their size was unknown. The problem, for development, was that even exploratory mining operations were expensive. The head of the commission charged with finding new reserves, P. Ia. Antropov, decided on Taboshary. Prospecting in different regions would eventually provide the knowledge needed, but given the time constraints, the commission wanted to focus on the most promising areas first. Nevertheless, Antropov decided on an exploratory approach, sending out expeditions to different regions, while instructing Soviet geological organizations to look for evidence of uranium as they studied other formations. Antropov's expeditions yielded results, not only in the expanding knowledge about likely uranium formations, but also in the number of working mines. By the end of 1948 mines had been started in the Ukraine, Estonia, the Caucasus, and in eastern Siberia. Mining uranium proved almost as difficult as locating it, particularly in Central Asia. Deposits were often in mountainous regions with few roads. Eastern Europe, particularly Germany and Czechoslovakia, at least in the early years, still proved the most reliable and productive region for the new industry. To process the ore into metal, a factory was set up at Elektrostal, some 44 miles (70 kilometers) east of Moscow. Overseeing production was Nikolaus Riehl, one of the German scientists brought east at the end of the war. He had actually been born in St. Petersburg and spoke fluent Russian. When the methods of uranium purification he had learned at the Auer plant in Germany proved too slow, he adopted an ether extraction method suggested by the Smyth Report. He also began using uranium tetrafluoride, instead of uranium oxide. Production reached three metric tons a week by September - October 1946. On Christmas Day, December 25, 1946, four years after Enrico Fermi had successfully tested CP-1 at Stagg Field in Chicago, Igor Kurchatov was ready to test a nuclear reactor of his own at Laboratory No. 2. A special reactor pit, 130 feet long by fifty feet wide by two stories tall had been dug outside his office in June. An adjoining laboratory surrounded by reinforced concrete walls had been equipped with dosimeters, warning sirens, and red lights, in case radiation reached dangerous levels, plus a brass submarine periscope to allow an observer to safely view the notches on the main control rod. F-1, an abbreviation of Fizicheskii-1 or "Physical-1," would house 400 metric tons of graphite and 45.07 metric tons of uranium. Nikolai Dollezhal', director of the Institute of Chemical Machine-Building, had helped with the design, which relied on gravity to insert vertically-aligned control rods from the top of the pile. A draft of the design was ready in March and approved in August. Kurchatov wanted to perform pre-criticality tests by constructing four sub-critical models. The first of the four was completed on August 1, 1946. Assembly of the final, full-scale reactor, was started on November 10, 1946. The uranium and graphite were stacked in alternating layers. The fifty-third layer, one layer short of criticality, was in place on December 24, 1946. Layer fifty-four, the final layer, was finished at 2:00 p.m. on December 25th. The three control rods were in place inside the reactor. When Kurchatov began the final phase later that afternoon, the two safety rods were totally removed, although, as a precaution they were not locked. In an emergency they could be released to stop the reaction. Kurchatov began by winching out the main control rod, then stopped. Nine feet still remained inserted. 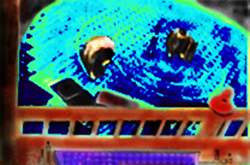 The neutron counters increased the rate of clicking while gamma-ray counters flickered red. After a ten-minute break, Kurchatov moved the control rod further out. The counters leveled off after an hour. Kurchatov repeated the test, then took a break. For the final test, he moved the rod out just two additional inches, then had the two emergency rods removed. It took a half hour for the detectors to reach the level of a continuous roar. At 6:00 p.m. Kurchatov made the pronouncement, "Well, we have reached it." The reactor had gone critical. By the time F-1 was tested, the foundations for an industrial-scale reactor, Cheliabinsk-40, some fifty miles (eighty kilometers) northwest of the city of Cheliabinsk, in the Urals had been laid. In March 1948 workers began assembling the reactor. Kurchatov was at the controls when the reactor went critical in a test, on June 7, 1948. On June 19th, the operational start-up began. Installation B, the plutonium separation plant at Cheliabinsk-40 was completed in December 1948, allowing production in early 1949. Like Hanford, its first stage involved the use of nitric acid to dissolve uranium slugs after their aluminum canning had been removed. Installation V, a large chemical-metallurgical plant, purified the plutonium coming out of Installation B, and converted it into metal. Until the plant became operational purification took place at "Shop No. 9," which began temporary operations on February 27, 1949, when it received its first nitrate solutions of plutonium. Permanent facilities were not ready until August. The Soviets, for U235 separation, essentially abandoned thermal diffusion in favor of gaseous diffusion and electromagnetic separation. Sverdlosk-44, a gaseous diffusion plant, was built thirty-one miles (fifty kilometers) north of Sverdlosk, in the central Urals. Sverdlosk-45, which concentrated on electromagnetic separation, was built at Severnaia Tura, in the northern Urals. Temporary Shop No. 9 had produced enough plutonium, by June 1949, for an atomic bomb. When scientists met with Stalin in the spring, they had tentatively planned a test date to coincide with their calculations for an expected June plutonium availability. Stalin however, was thinking in terms of an immediate confrontation with the United States, in the wake of a successful test. He wanted a second bomb available immediately. The scientists determined that a second bomb would be possible in August, given the plutonium production rate of 100 grams per day. The date of First Lightning was set for August. Enriching uranium and separating plutonium had been monumental obstacles for both the American and Soviet programs. Implosion, a concept deceptively easy to understand, proved as devilishly elusive to conquer for the Soviets as it had been for the Americans. The best detonating caps provided by the Soviet army came up short, in an operation which required microsecond precision. KB-11 (konstruktorskoe biuro-11) (Design Bureau 11), at Sarov, the Russian equivalent of the Los Alamos lab in New Mexico, had been set up in 1946. (Arzamas-16, the common designation for the facility, was sometimes called 'Los Arzamas.") Located about 250 miles east of Moscow, it was better suited to explosives testing than Kurchatov's Laboratory No. 2 in Moscow. Yakov B. Zel'dovich, appointed head of the theoretical department at KB-1, was assigned the twin problems of implosion and detonation. V. A. Tsukerman, a blind scientist who relied on his wife for help with laboratory experiments, had developed X-ray analysis techniques for studying exploding armor-piercing shells. He now applied his analysis to detonating wave movement in metals such as iron and bronze. Responsibility for the firing system operating the detonating caps, as well as the bomb's electrical systems, fell to V. I. Alferov, whose background included that of director of a plant which had produced naval mines and torpedoes. In June 1949, Research Institute No. 9 (NII-9) (Nauchno-issledovatel'skii institut No. 9) fabricated the two plutonium hemispheres for the test bomb. A. A. Bochvar, NII-9 director, had supervised the fabrication. After being coated with nickel, they were transported to Arzamas-16. The task of "tickling the dragon's tail," the experimental confirmation of critical mass done by Otto Frisch at Los Alamos, was assigned to Georgi Flerov, who worked in a small hut situated away from the other buildings at the site. In the spring of 1946, Yuli Khariton, the scientific director of Arzamas-16, had assembled a scale-model of the American Fat Man for Stalin. With Stalin and Beria both insisting that scientists not deviate from a proven design, the only freedom of choice was in the name. In July, one of Beria's aides came up with something. He called it "Stalin's Rocket Engine," or RDS-1, (Reaktivnyi dvigatel Stalina). The real RDS-1, no longer a one-tenth scale model, was ready for its test by late summer 1949. The components were loaded on a train at Sarov in mid-August and then traveled some two thousand miles to Semipalatinsk-21, where they were transferred to trucks for the thirty-mile drive to the test site. The tower which would hold the assembled bomb was a hundred feet high. The bomb was finally assembled at the base of the tower at 2:00 a.m. on August 29th. Beria, worried to the end about security, could hardly believe that Kurchatov and the other scientists would leave the bomb unguarded for the freight elevator ride to the top of the tower. Pavel Zernov, Director of Arzamas-16, made a last-minute decision to accompany the bomb on the elevator as it traveled the last few feet of its journey. A grateful Stalin awarded five of the physicists the title of Hero of Socialist Labor following the successful bomb test. It was the highest honor the Soviet Union could bestow. The five were Kurchatov, Khariton, Shchelkin, Zel'dovich, and Flerov. Kurchatov and Khariton received the ZIS-110 automobile, cash awards, and dachas. The state would pay for their children's education at any educational establishment. Another perquisite was free transportation within the Soviet Union for themselves, their wives, and their children. Other scientists were similarly honored. The purification of uranium and uranium metal fabrication were deemed significant enough to allow even a non-Russian to share in the honors. Nikolaus Riehl, the German scientist who joined the program at the end of World War II, was also awarded the Hero of Socialist Labor. Harry Truman could only guess at the number of atomic bombs Stalin had. The U.S. had at the time at least a hundred bombs. On September 24, 1951, the Soviets tested a bomb with a new design, then followed up on October 18th with the successful test of a bomb dropped from a Tu-4 bomber. On August 12, 1953 they would test a hydrogen bomb, a layer-cake thermonuclear device proposed by Andrei Sakharov. Sakharov's "layer cake" design alternated layers of light elements, including deuterium and tritium, and heavy elements (U238). Rather than silence, the test had been preceded by something of a public announcement. Georgi Malenkov, on August 8th, speaking before the Supreme Soviet, remarked that the United States had no monopoly on the atomic bomb, nor on the hydrogen bomb either. (Stalin had died in March 1953.) The yield, of Joe 4, on August 12th, was four hundred kilotons. The First Lightning test had yielded about twenty kilotons (of TNT). 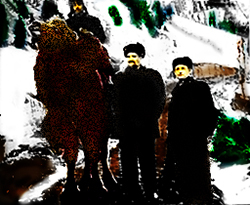 On Sunday, February 7, 1960, Igor Kurchatov stopped to visit Yuli Khariton at a spa near Moscow. They went for a walk in the park and found a bench to share. Khariton began discussing some recent experimental work when he became aware that Kurchatov was unusually quiet. When he turned to look, Kurchatov's eyes were glassing over. Khariton summoned help, but a blood clot had blocked the coronary artery, causing a fatal heart attack. He was fifty-seven. Robert Oppenheimer would die of throat cancer on February 18, 1967, at the age of sixty-two. Russian speculation was that working for Beria had shortened Kurchatov's life. Oppenheimer's cancer was probably related to his heavy smoking, but there was a feeling among some of his friends that the withdrawal of his security clearance had been a devastating blow. Christopher Andrew and Oleg Gordievsky, "KGB: The Inside Story of Its Foreign Operations from Lenin to Gorbachev," HarperCollins Publishers, (New York, NY 1990). Rodney Barker, "The Hiroshima Maidens: A Story of Courage, Compassion, and Survival," Viking Penguin, Inc., (New York, NY 1985). D. J. Bennet and J. R. Thomson, "The Elements of Nuclear Power," 3rd Edition, Longman Scientific & Technical, (New York, NY 1989). Henry A. Boorse, Lloyd Motz, and Jefferson Hane Weaver, "The Atomic Scientists: A Biographical History," John Wiley & Sons, Inc., (New York, NY 1989). G. I. Brown, "The Big Bang: A History of Explosives," Sutton Publishing, (Phoenix Mill, UK 1998). Brian Cathcart, "The Fly in the Cathedral," Farrar, Straus and Giroux, (New York, NY 2004). Cathy Cobb, "Magick, Mayhem, and Mavericks: The Spirited History of Physical Chemistry," Prometheus Books, (Amherst, NY 2002). Rachel Fermi and Esther Samra, "Picturing the Bomb: Photographs from the Secret World of the Manhattan Project," Harry N. Abrams, Inc., Publishers, (New York, NY 1995). Phyllis Fisher, "Los Alamos Experience," Japan Publications, Inc., (Tokyo 1985). J. Arch Getty and Roberta T. Manning, eds. "Stalinist Terror: New Perspectives," Columbia University Press, (New York, NY 1993). Stephane Groueff, "Manhattan Project: The Untold Story of The Making of the Atomic Bomb," Little, Brown and Company, (Boston, MA 1967). Leslie R. Groves, "Now It Can Be Told: The Story of the Manhattan Project," Harper & Brothers, (New York, NY 1962). David L. Heiserman, "Exploring Chemical Elements and Their Compounds," TAB Books Division of McGraw-Hill, (New York, NY 1992). Harry Henderson, "Nuclear Physics," Facts On File, (New York, NY 1998). Greg Herken, "Brotherhood of the Bomb: The Tangled Lives and Loyalties of Robert Oppenheimer, Ernest Lawrence, and Edward Teller," Henry Holt and Company, (New York, NY 2002). David Holloway, "Stalin and the Bomb: The Soviet Union and Atomic Energy 1939-1956," Yale University Press, (London, UK 1994). Jeremy Isaacs and Taylor Downing, "Cold War: An Illustrated History, 1945 - 1991," Little, Brown and Company, (New York, NY 1998). J. S. Kidd and Renee A. Kidd, "Quarks and Sparks: The Story of Nuclear Power," Facts On File, Inc. (New York, NY 1999). Lansing Lamont, "Day of Trinity," Atheneum, (New York, NY 1965). Michael Light, "100 Suns: 1945-1962," Alfred A. Knopf, (New York, NY 2003). Robert James Maddox, "Weapons for Victory: The Hiroshima Decision Fifty Years Later," University of Missouri Press, (Columbia, MO 1995). Roy Medvedev, "Let History Judge: The Origins and Consequences of Stalinism," Columbia University Press, (New York, NY 1989). Roy Medvedev and Zhores Medvedev, Ellen Dahrendorf, Translator, "The Unknown Stalin: His Life, Death and Legacy," The Overlook Press, (New York, NY 2004). Richard L. Miller, "Under the Cloud: The Decades of Nuclear Testing," The Free Press, (New York, NY 1986). Norman Moss, "Men Who Play God: The Story of the H-Bomb and How the World Came to Live With It," Harper & Row, Publishers, (New York, NY 1968). Anthony V. Nero Jr., "A Guidebook to Nuclear Reactors," University of California Press, (Berkeley, CA 1979). John Newhouse, "War and Peace in the Nuclear Age," Alfred A. Knopf, (New York, NY 1989). Major General K. D. Nichols, U.S.A. (Ret. ), "The Road to Trinity," William Morrow and Company, Inc., (New York, NY 1987). Walter C. Patterson, "The Plutonium Business and the Spread of the Bomb," Sierra Club Books, (San Francisco, CA 1984). Ronald Radosh and Joyce Milton, "The Rosenberg File: A Search for the Truth," Holt, Rinehart and Winston, (New York, NY 1983). Richard Rhodes, "The Making of the Atomic Bomb," Simon & Schuster, (New York, NY 1986). Richard Rhodes, "Dark Sun: The Making of the Hydrogen Bomb," Simon & Schuster, (New York, NY 1995). Tamara L. Roleff, "The Atom Bomb," Greenhaven Press, Inc., (San Diego, CA 2000). Albert Stwertka, "A Guide to the Elements," Oxford University Press, (New York, NY 1998). Ference Morton Szasz, "The Day the Sun Rose Twice: The Story of the Trinity Site Nuclear Explosion, July 16, 1945," University of New Mexico Press, (Albuquerque, NM 1984). Ronald Takaki, "Hiroshima: Why America Dropped the Atomic Bomb," Little, Brown and Company, (New York, NY 1995). Gordon Thomas and Max Morgan Witts, "Enola Gay," Stein and Day, (New York, NY 1977). Jonathan M. Weisgall, "Operation Crossroads: The Atomic Tests at Bikini Atoll," Naval Institute Press, (Annapolis, MD 1994). Eileen Welsome, "The Plutonium Files: America's Secret Medical Experiments in the Cold War," The Dial Press, Random House, (New York, NY 1999). Allan M. Winkler, "Life Under a Cloud: American Anxiety About the Atom," Oxford University Press, (New York, NY 1993). Peter Wyden, "Day One: Before Hiroshima and After," Simon & Schuster, (New York, NY 1984).